Up the ante and raise the bet! 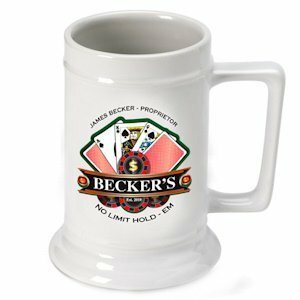 Your poker player will love using this personalized beer stein at his weekly poker games with his buddies. Perhaps the most popular poker game in America today, Texas Hold 'Em offers hours of enjoyment for so many. The white ceramic stein is printed in full color and holds up to 16 ounces of a favorite beverage. It is sure to be the envy of any poker party!